Green tea may provide a number of health benefits, such as lowering your risk for cancer, high cholesterol and Parkinson's disease, according to MedlinePlus. Although research is still in the preliminary stages, green tea may also help reduce your risk for developing diabetes and the complications sometimes associated with this condition. It may also make it easier to control your blood sugar levels. Diabetics can safely drink green tea, but they should carefully monitor their blood sugar levels because of the potential blood sugar-lowering effect of green tea. A study using mice published in the "British Journal of Nutrition" in April 2011 found that an antioxidant found in green tea called epigallocatechin gallate, or ECGC, may help delay the onset of Type 1 diabetes. Other animal studies have shown that green tea may help regulate blood glucose levels and help slow the progression of this condition once you have it, according to the University of Maryland Medical Center. Further studies would be needed to verify that these benefits occur in people as well as animals. Drinking caffeinated green tea may help lower your risk for Type 2 diabetes, according to a study published in "Annals of Internal Medicine" in 2006. Study participants who drank at least 6 cups of green tea per day had a 33 percent lower risk for Type 2 diabetes than participants who drank 1 cup or less per week. Drinking at least 3 cups of coffee per day had a similar effect, but drinking black or oolong tea didn't decrease diabetes risk. Once a person has diabetes, however, it may be best to drink less green tea; a preliminary study using animals published in "BioFactors" in 2007 found that high doses of green tea may increase blood sugar in diabetics, compared to drinking lesser amounts or not drinking green tea. Drinking 3 cups per day of green tea for 14 weeks helped limit increases of waist-to-hip ratio in women and increases in fasting blood sugar levels. These results can can lead to improved blood flow and increased antioxidant levels, potentially decreasing the risk for obesity and other complications related to diabetes, according to a study published in "BioMed Research International" in 2013. Limit the amount of caffeinated green tea you drink to avoid consuming too much caffeine, which can cause side effects including heart palpitations, insomnia, irritability, headaches, diarrhea and vomiting. Check with your doctor before adding green tea to your diet, because it can interact with a variety of medications, including beta-blockers, blood thinners, MAOIs and birth control pills. What Drink Will Help Lower Blood Sugar? 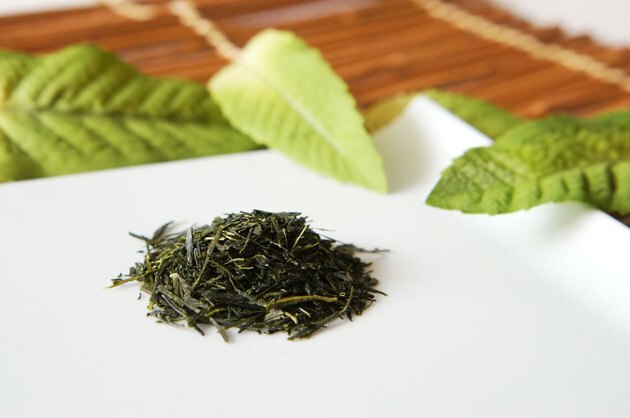 Can Green Tea Affect Liver Function Test Results?